Asus has used the IFA 2018 tech show in Berlin to show off its latest ZenBooks, including what the company calls “the world’s most compact laptops”. The laptops about which Asus is making that bold claim are the ZenBook 13 (UX333), ZenBook 14 (UX433) and ZenBook 15 (UX533). These premium laptops have been redesigned to be thinner and lighter than ever before, and include an almost frameless NanoEdge display. This incorporates incredibly thin bezels around the screen on all four sides, offering an up to 95% screen-to-body ratio, which Asus claims gives the laptops the smallest footprint in their class. The ZenBook 13 and ZenBook 14 can also come with Asus’ exclusive NumberPad, which turns the touchpad into a full-size LED-illuminated numeric keypad. All models have 3D IR cameras for logging into Windows 10 using facial recognition and the Windows Hello feature, and they boast the attractive premium designs that we’ve come to expect from the ZenBook range. These new ZenBooks also meet military-grade reliability standards – they're able to withstand extreme altitudes, temperatures and humidity, and have been put through extensive drop, shock and vibration testing. They're also packed with some of the latest technology, including 8th-generation Intel Core processors, discrete graphics cards up to Nvidia GeForce GTX 1050 Max-Q, 16GB of RAM and super-fast PCIe SSDs (solid state drives). Those new ZenBooks are impressive enough, but Asus didn’t stop there. It also showed off the new ZenBook Pro 14, which is a smaller, more portable version of the ZenBook Pro 15, and includes the ScreenPad, Asus’ attempt to revolutionise the touchpad of the laptop by turning it into a touchscreen. Speaking of the ScreenPad, Asus has also released new apps for it: Adobe Sign, Handwriting and SpeechTyper, and there are a number of improvements and new features included. This update can be downloaded for free from the ScreenPad settings menu. 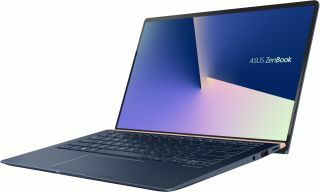 Asus has also announced new ZenBook Flip 13 and Flip 15 convertible laptops, which are 10% smaller than previous models, which Asus claims makes them the most compact convertible laptops in the world. These ZenBook Flip laptops include 8th generation Intel Core processors, Nvidia graphics and a Pantone Validated display for brilliant color reproduction. Asus has not revealed prices for these new laptops just yet, but promises availability of the ZenBook 13, 14 and 15 in North America in the first half of October 2018. As for the rest of the world, Asus has simply told us to expect them sometime in the fourth quarter of the year, but that specific dates and pricing will be confirmed soon.